Towards the end of 2017 Susan was approached by one of the editors at Fox Chapel Publishing to write a step-by-step project article for the 2018 edition of their annual Pyrography magazine. The editor had come across Susan's "Egg-ceptional" gallery page on the web site and was "charmed" by the idea of birds on eggs. Although wooden eggs had featured in the magazine before, this particular concept was something different and one the editor felt sure would appeal to their readers. Susan agreed to act as contributor by sharing one of her design ideas and a deadline was set for the article. 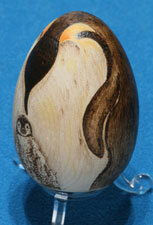 The design Susan used was that of an Emperor penguin and chick. This she felt would be within the capabilities of both the novice and the more experienced pyrographer. Also, with worldwide readership in mind, it would be a bird universally recognised. The article entitled "Penguin Embrace" appeared in the Spring 2018 issue of Pyrography. Three pages in length it uses photos and captions to lead the reader step-by-step through the project. Susan demonstrates the use of two different wire nibs and shading techniques as well as the use of colour. 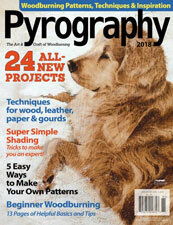 The magazine is crammed with a variety of projects, patterns and features as well as techniques and advice on pyrography equipment. Now in its sixth year it is eagerly anticipated by pyrographers worldwide and is one of four published by the American based company. The other three are Woodcarving Illustrated, Scroll Saw Woodworking and Crafts and DO Magazine. Fox Chapel Publishing have a range of more than 200 book and DVD titles aimed at enthusiasts who enjoy a variety of crafts and hobbies. There are now several of these on pyrography. Sold on newstands in America, Pyrography 2018 is also available from retailers and via mail order direct from Fox Chapel Publishing. Susan offers private tuition with courses and themed workshops designed to accommodate all levels of ability. Should you be interested in receiving personal guidance on recreating the Penguin Embrace design featured or a three dimensional design of your own please see the Courses page for details. Please note that, as usual, copyright for this design remains with the artist and patterns provided should be used for personal crafts and gifts only.